In this edition of Teaching and Learning Moments, Shabnam Virmani talks about her journey through the social and spiritual worlds and about her constant endeavour to find the middle path in a world that is filled with polarity. Shabnam Virmani is a documentary film maker, nirguni singer and artist in residence at the Srishti School of Art, Design and Technology in Bangalore. 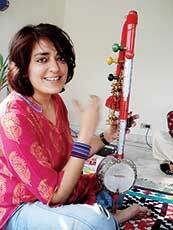 Shabnam started off as a journalist and then moved to film making. In 2003, she set out on a journey that would change the course of her life. Camera in hand, she ventured into diverse socio-cultural, religious and musical landscapes, meeting with singers from Malwa, Rajasthan, and Pakistan in a quest for the spiritual and socio-political resonances of the 15th century mystic poet Kabir in our contemporary world. Six years later, these experiences gave birth to the Kabir Project, with four documentary films, several music CDs and books. As Shabnam travelled into far flung lands in search of Kabir, she also journeyed within. Somewhere in the middle of all this, Shabnam began to sing. She took up playing the 5-stringed tambura herself and today sings a wide range of folk songs of Kabir and other mystic poets. After I came back to India after completing my masters in the US, I spent 13 years working with the women’s movement and with social activist groups, supporting them with video and community radio. The next 13 years, I spent in my quest for Kabir, Sufism, and other mystic poets. I feel these two phases of my life speak to each other, and yet there is a tension between these two worlds – the social and the spiritual. One is a fiercely outward gaze and the other fiercely inward gaze. And I found that in Kabir the social and the spiritual is one. He demands from you an inner and outer gaze that is equally fierce. But if we selectively appropriate aspects of him, we are not seeing him as an integral being. Guru – Is he inside or outside? At one level Kabir says ‘the guru is within’ but then he also says ‘Guru govind dohu khade, kake lagu paanye’ which invokes a very human form of guru. But you realize that if you see this as contradictory, you are still stuck in the duality that Kabir is asking you to get out of. It’s not this or that, it can be both. Personally, I perceive both very palpably. There are people who have entered my life who have opened doors and windows for me, who have been my gurus. Yet, I know that if I was not attentive to the guru within, it wouldn’t help. You can never let go of your own vivek. It’s a very difficult practice to negotiate power politics without subscribing wholly and solely to your identity. How can you fight the kind of caste discrimination that is happening in say minority caste without identifying really strongly with your dalit identity? And yet that is what Kabir is asking us to do. He is asking us not to define ourselves so surely; to stay alert so that we do not create another dualistic paradigm of oppressor-oppressed. He is asking us not to answer such a dualistic paradigm with yet another dualistic response. But how this plays out in action, in mobilizing, in responding to what is happening around us, I have no idea. The important question to ask is: How can you be an actor in the world where you confront social injustice whether it’s caste, gender or religious minority injustices without deepening these dualisms?